Tanzania with its capital Dodoma is located in Africa (Eastern Africa, bordering the Indian Ocean). It covers some 947,301 square kilometers (more than six times the size of Georgia) with 53,950,900 citizens. Swahili, English and Arabic are the languages commonly used by the people in Tanzania (consider regional differences). Burundi, Democratic Republic of the Congo, Kenya, Malawi, Mozambique, Rwanda, Uganda and Zambia are bordering countries. Tanzania is the largest country in East Africa, bordered by Kenya and Uganda to the north; Rwanda, Burundi, and the Democratic Republic of the Congo to the west, and Zambia, Malawi, and Mozambique to the south. Tanzania is a country with great national parks, where you can see some of the finest African flora and fauna. Tanzania is home to several national parks and game reserves. Safaris in Tanzania can be put into two categories, the Northern Circuit (Serengeti, Ngorongoro, Manyara and Tarangire) and the Southern Circuit (Selous, Mikumi and Ruaha). This is certainly an oversimplification and does not include other interesting but harder to reach parks such as Katavi and Gombe, just to name two. For tourist, the two first groupings are more accessible as several tour companies offer a variety a packages for these. The landscape is plains along coast with central plateau as well as highlands in north, south. The average density of population is about 57 per km². The climate in Tanzania can be described as varying from tropical along coast to temperate in highlands. Potential threats by nature are drought, flooding on the central plateau during the rainy season and limited volcanic activity; Ol Doinyo Lengai (2,962 m) has emitted lava in recent years; other historically active volcanoes include Kieyo and Meru. To reach someone Tanzania dial +255 prior to a number. The local cellular networks are operated on 900 MHz, 1800 MHz, 3G, 4G. Websites typically end with the top level domain ".tz". If you want to bring electric appliances (e.g. battery chaarger), keep in min the local 230 V - 50 Hz (plugs: D, G). The sign for the locally used currency Shilling is TZS. 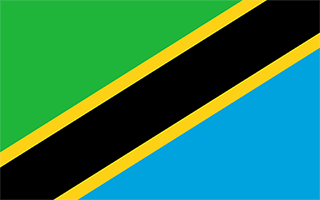 Divided diagonally by a yellow-edged black band from the lower hoist-side corner; the upper triangle (hoist side) is green and the lower triangle is blue; the banner combines colors found on the flags of Tanganyika and Zanzibar; green represents the natural vegetation of the country, gold its rich mineral deposits, black the native Swahili people, and blue the country's many lakes and rivers, as well as the Indian Ocean.